You are invited to join together at the sixth Baker-Blumin-Passin-Robinov Family Reunion, to be held in San Diego, California at the beautiful Paradise Point Resort June 26-29, 2016. About fourteen years ago several relatives from a list compiled by cousin Sylva Baker, our official Family Genealogist, were polled to see whether there was interest in holding a family reunion. Howard Baker and a committee of family members organized a wonderful reunion in Lake Buena Vista, Florida in late June 2004 that was attended by more than 60 relatives from 11 states, Canada, France and The Netherlands. The amazing spirit and warm feelings that highlighted the Florida reunion led the family to hold another in San Diego in June 2006 where nearly 100 family members from infants to super seniors enjoyed a most wonderful gathering. Our third reunion in June 2009 was held in Scottsdale where we once again enjoyed a warm family feeling that matched Arizona’s summer temperature. In July 2012, approximately 60 of us visited Kent Island on Chesapeake Bay for our fourth reunion and everyone, once again, had a great time. Howard Baker passed the baton of chair to Doug Moody and he and our Canadian cousins organized our fifth reunion in July 2014, at the wonderful Town of Blue Mountain north of Toronto. This reunion continued the sense of closeness and excitement to be with family that all the others created. Now we are looking forward to another great event in San Diego next June, a time for us to again experience the special feeling and sentiment that only a family reunion can generate. We are pleased to report that after many months of research and surveys that you responded to, along with discussions in some informal family get-togethers, we have finalized the location and have exciting Reunion details to share with you. 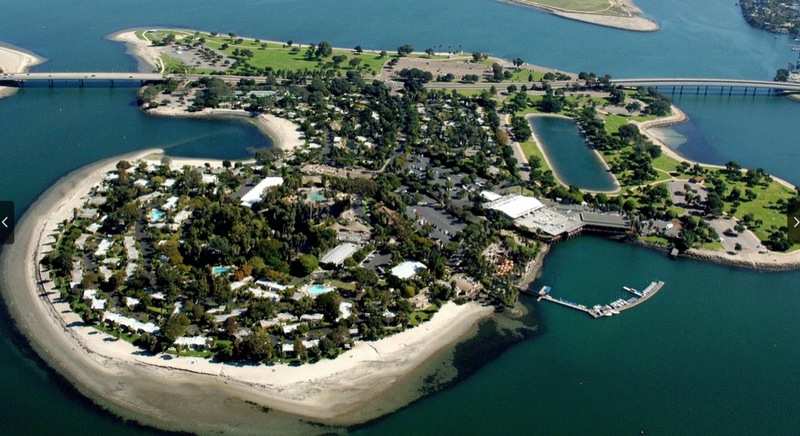 Our 2016 Reunion will be held at Paradise Point Resort on Mission Bay in San Diego, California. The Resort is one of the most popular destinations for visitors in one of the most visited tourist destinations in the US. At one time or another most of the west coast Committee’s families have stayed at Paradise Point and enjoyed all it had to offer. Right up against the water across from SeaWorld, near the world famous San Diego Zoo and Old Town, the Point is 40+ acres of beachfront, pleasant bungalows, outdoor activities, dining options, swimming pools, full-service marina and so much more. (See the resort at http://paradisepoint.com for further details. Paradise Point is made up of many “villages.” The Point management has agreed to put us all in the same village, if possible, close to our dining and meeting rooms. We will have exclusive use of a very spacious hospitality suite. Additionally, the Point is waving all resort fees that are usually charged for use of the fitness center, sports facilities, mini golf, internet access and more. There will be no need to tip the resort staff, as gratuities are included in the Reunion budget. Paradise Point and its amenities offer a unique San Diego vacation experience for both families and couples with a location that is secluded, yet centrally situated; the airport, downtown San Diego and top attractions including Old Town, the San Diego Zoo, and Balboa Park are all just minutes away from its shores. Reunion planning is still in its early stages, but we intend to follow the same format that has been so successful in the past (“If it ain’t broke………”). If you would like to be part of the planning, or just give us some ideas of what you would like to see happen, let us know. We will begin everything on Sunday afternoon, June 26th with room registration, Reunion sign-in and hospitality, followed by a getting to know you reception, a relaxed dinner and a family meeting. Varied morning activities will include breakfast at any of the open dining venues within the Resort, of which there are many, as well as a specialty coffee bar. For the early risers we will be asking cousins Cindy and Julie Baker to once again organize a wake-up walk/run along Mission Bay. A golf outing will be available for those who want one with details and costs to be announced. Mornings can be filled with the use of the luxury Spa, Paradise Surf Academy, the Marina and its water sports, and unlimited use of the fully equipped Fitness Center, Tennis, Basketball, Bike Riding, Putting mini-golf course, and Bocce Ball. Your afternoons can be spent relaxing by one of the pools or at the hospitality room, where you can get caught up with those you have met before and get to know those who your have just met. Mornings and afternoons can also include visiting the many attractions in San Diego, with ideas and tour tickets available through the Point. We hope to have late afternoon get-togethers to learn more about our family history and share stories and memories. We encourage you to take full advantage of everything Paradise Point and greater San Diego has to offer you, but please plan to attend all of the dinner meals and family meetings. There is nothing like the energy in the room, the family sings and after dinner kibitzing. We are also researching opportunities for an off-resort activity for everyone. The Committee has taken great care and time to find the best place to hold our reunion. We have found that the Point offered us the best room rates available for a venue in California in the most attractive part of San Diego, by the ocean on Mission Bay. The Point has reduced its summertime rate for our Reunion by well over 1/3, to $199. plus tax and fees per night, for a Lanai Garden Room. Also, the Point has waived the usual resort fee and overnight parking fee, which normally costs an additional $72 for both per day. The Lanai Garden rooms are comfortable, with one king bed and a sleeper sofa or two queen beds, and come with free high speed internet service, cable TV, coffee maker and mini-refrigerator in approximately 450 square feet of space. Connecting rooms are available, as well as upgrades. We are returning to our traditional registration fee of $250 per adult;$195 per child (12 and under); $45 per child (4 and under) . Sorry folks, we have held everything we could to a minimum. Prices everywhere continue to rise, especially food costs. The fee includes all evening meals, breakfasts, snacks, commemorative mementos, and incidentals. The Spa, greens fees for golf and other optional activities (i.e. water sports, tourist attractions) will be extra. In a few days you will receive a “reservation booking information” sheet which will have all of the information necessary to make your reservation for your room/(s) including reference number, online booking procedure, rates and room information. You can go on line or call the Point’s toll free information number and speak with a resort representative to answer all of your specific accommodation questions. We need your help. Please book your room(s) early! The resort requires a one night’s deposit, which, if you have to cancel, is refundable for up to seven days before the reunion. While the Point’s very special room rates for the family are only available until May 27, 2016, we are asking you to make your reservation much earlier; by December 15th. The number of rooms booked by December 15th is essential to our overall planning. Paradise Point is located in the center of Mission Bay just 15 minutes from the San Diego Airport, with taxi fares totaling approximately $20. Taxis and shuttles are available at all airport terminal curbsides for service to the Resort, and prior arrangements are not required. For guests using their personal vehicle or a rental car, the hotel offers reserved doorstep parking directly outside guest rooms. The Point will be glad to provide detailed travel information for you if needed. For your travel planning purposes: the official beginning of the Reunion will be at dinner on Sunday evening the 26th and the Reunion will end mid-morning on Wednesday the 29th after our closing breakfast. We continue to obtain contact information about additional family members (including newborns, marriages, etc.) enabling our Family Tree to keep growing. Some family members contact us after they notice the Baker-Blumin-Robinov-Passin family website that was created prior to our first reunion by Chicago cousin Michael Baker, our official Family Webmaster. The website – www.bakerbluminfamilytree.com – serves as a focal point to earn about our family history, check for updates, birth/death and other announcements as well as to view family pictures, learn of our family’s expanding connections and relive the happy moments of the prior reunions. Please visit the site and contribute to our tree by filling in missing information about your family members such as: complete names, maiden names, parents’ names, dates and locations of births, marriages and death, cause of death, children names, etc. We also would like to have more historic family pictures to display. Please contact Michael Baker via e-mail at webmaster@bakerbluminfamilytree.com with any additional information or questions. We hope you are exited about the Reunion and will make every effort to attend. Some of you will want to be with us because you so enjoyed previous reunions. Some of you will come because this Reunion is where you want to be. Some of you who have never attended will come out of curiosity; to meet people whose lives are intertwined with yours by a common heritage, and to find out where you fit into the family story. We assure you that if you cannot, or choose not to, come you will be missed! Please make your hotel reservations as soon as you receive the instructions to do so, book your travel, and return your registration form, with payment, as soon as possible.